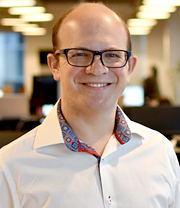 In London, tech-enabled customer insights platform Streetbees has hired shopper and consumer specialist Ben Langleben as Client Strategist, with a focus on uncovering growth opportunities for corporate clients. Streetbees combines artificial intelligence and geolocation technology to collect data from more than two million users (or 'bees'), who share moments from their daily lives through videos, photos and text using a chat-style app. By applying advanced natural language processing technology to the results, the company can uncover not just what users do, but also why they do it and what they may do next. A year ago, it raised $12m in a Series A round of funding, which it has been using to further develop its Always On machine learning technology and expand its UK and US teams. Langleben (pictured) joins after running his own company Kobelt Consulting, before which he worked for Nielsen as Senior Director and Team Lead of the Innovation Practice. Prior to this, he was a Senior Director at concept testing and forecasting software developer Affinnova, Strategic Client Director at MarketTools, Head of Quantitative Research at rdsi, and Principal at Incite Marketing Planning; having begun his career at Research International. Commenting on the appointment, CEO and founder Tugce Bulut said: 'Ben truly understands the disruptive power of technology and how it can help brands understand the context and emotion behind every moment of choice. He will greatly expand our capacity to surface insights from our network of two million 'bees' worldwide and distil their importance for the world's biggest companies, helping them develop products that serve their customers' needs'. The firm has just joined Silicon Valley-based innovation platform Plug and Play's 'Brand & Retail' accelerator programme, through which it will collaborate and work with the organisation's 280 corporate partners on a variety of brand issues.